NEW YORK (Bloomberg) -- Investment bankers for General Motors Co. have met with sovereign wealth funds and private investors in the Middle East and Asia to gauge interest in the automaker's planned stock sale, said two people familiar with the meetings. GM's bankers had planned to approach Riyadh, Saudi Arabia- based Kingdom Holding Co., Abu Dhabi-based Mubadala Development Co., Qatar Holdings LLC and Singapore-based Temasek Holdings Pte. about GM's initial public offering, said one of the people, who asked not to be named because the discussions are private. Seeking large international investors is one way for the nation's largest automaker to generate demand for its stock in preparation for an IPO next month. GM and its bankers are forging ahead with the stock offering in a year when at least 47 companies have postponed or withdrawn U.S. IPOs, two people familiar with the plan said. GM and the U.S. Treasury Department, which owns 61 percent of the company, aim to hold an $8 billion to $10 billion IPO in November, which is scaled back from the company's original plan of as much as $16 billion, two people familiar with the matter said last month. The department is more interested in a high share price than a large initial sale, they said. A GM spokeswoman, Noreen Pratscher, declined to comment. A $10 billion share sale by GM would be the biggest U.S. IPO since Visa Inc.'s $19.7 billion raised in March 2008. The offering would be the third-largest all-time in the U.S., also trailing AT&T Wireless Group's $10.6 billion offering in 2000. The largest deal to be postponed this year was Liberty Mutual Agency Corp.'s proposed $1.3 billion IPO. The company delayed its offering on Sept. 29 because demand was below expectations, the insurer said. Had the deal gone through it would have been the biggest U.S. IPO so far in 2010. While the market has been tough on some deals, Therian said that the right IPOs can still get done. IPOs in the U.S. have raised $20.95 billion so far this year, 95 percent more than the same period a year ago, data compiled by Bloomberg show. “It's not where it was in mid-decade, but it's headed in the right direction,” Therian said. Petroleo Brasileiro SA, Brazil's state-controlled oil producer, raised as much as $70 billion last month in the world's largest share sale as investors bet on its plans to double output within a decade by tapping offshore fields. For the U.S. to recoup its $50 billion investment in GM, it needs to sell at an average price, before splits, of $131 a share, said a person familiar with the matter. The stock will likely be split to sell at an initial price of around $20 a share, said one person familiar with the offering. Neil Barofsky, the special inspector general for the Troubled Asset Relief Program, put the figure at $133.78, before splits. While the U.S. bailout was paid for with TARP money, only a portion of the government's stake will be sold in the initial offering. Sovereign funds, which may buy stock in GM to diversify away from oil and gas investments, tend to be large, patient, investors who keep broad portfolios, three of the people said. They also don't quibble over the price, nor do they agitate for management changes, two of the people said. Qatar is the third-largest shareholder in Volkswagen AG with a $5.22 billion stake, according to data compiled by Bloomberg. It also owns London's Harrods Department Store Co. Mubadala has a stake in Fiat SpA's Ferrari SpA. Abu Dhabi's Aabar Investments PJSC is the largest shareholder in Daimler AG, the maker of Mercedes-Benz cars, with a 9.08 percent stake, according to data compiled by Bloomberg. Daimler's second-largest stakeholder is Kuwait Investment Authority, with 6.89 percent of the Germany automaker. SAIC Motor Corp. Ltd. may also buy some stock in GM. 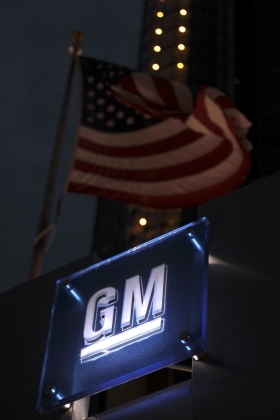 The Shanghai-based automaker is one of GM's partners in China. The Treasury Department is willing to sell the company at most 1 percent of GM, two people said. GM is still planning a November IPO, said the people. The company has not committed to a date and may delay if demand for shares were to falter. Even in a tough market, GM's IPO should generate plenty of interest, said David Whiston, equity analyst with Morningstar Inc., a Chicago-based investment research firm. Auto sales in the U.S. appear to have bottomed out around 11.5 million vehicles a year. Any rise in the car market bodes well for GM stock, he said. September sales rose to an annual rate of 11.8 million, the highest since the federal “cash for clunkers” incentives ended in August 2009, according to Autodata Corp.